Experience The Celebration, The Ritual, The Beauty. 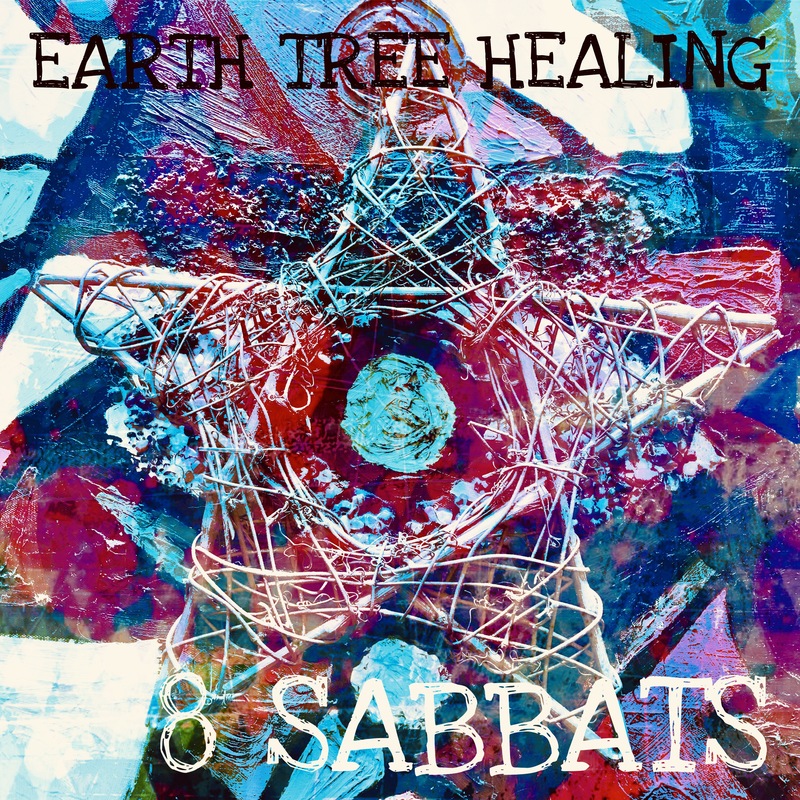 8 Sabbats’ by Earth Tree Healing is the 6th release from Composer/Multi-Instrumentalist Claudine West. This New Age instrumental album celebrates The Wheel of the Year, salutes the Equinoxes, Solstices and Harvest Festivals. From relaxing meditation music to dancing around a Beltane fire. For fans of good vibrations. Claudine meditated and channelled energies to capture the essence of each Sabbat/track. Available from digital stores (iTunes, Amazon Music, Spotify, Google Play etc) and on CD, October 31st 2017. The Wheel of the Year (on the traditional Pagan calendar) begins at Samhain. Also known as All Hallows Eve/Halloween. It includes Celtic Festivals with the annual cycle of Solstices, Equinoxes and Festivals. We celebrate the suns transition, fertility, harvests, fire, creativity. We honour the past year and plan the future..
1. Samhain (31st October) As summer ends, we enter the dark half of the year. The vale is thin between our world and the other world. Also known as All Saints Day and Halloween. Samhain is a personal journey I undertake to Wales, with family. Our descendants who reside in the Summerlands gather and dine. Rituals, Divination. Candles burn until they disappear. This is our time together. As the Wheel of the Year continues. We are thankful of the harvests this year. We carve pumpkins, make pumpkin fritters with brown sugar. With a leg of lamb with the roast. The head of the table is laid and dines with us. We place our candles there for our loved ones. This blue library room is where we congregate. Pudding is apples and plenty of brandy for pudding Samhain. The Blue Room Wales. Samhain. 2. Yule (21st December) The Winter Solstice. The shortest day. It’s time for us to light the Yule log. Celebrate the rebirth of the sun. Watch the fire crackle, bring warmth and hot soup for the soul. Settle with the cats as the evenings get darker and magical. We prepare our intents for the coming year of new adventures. As a child the excitement of the winter snow has never left me. The white blanket that comforts. Present giving and seeing the surprise and gratitude is wonderful feeling. I’m hoping with a little help from the law of attraction, 2018 will bring a Hurdy – Gurdy 😉 (Luckily we just got given a free hot tub!) This time has also been spent with our circle in Wales. With this track I wanted to enhance that magical feeling. The peeping from under the covers. Rebirth in the Solstice sun. 4. Ostara (21st March) (Spring Equinox) From the North to the East to the South to the West. This is the Spring Equinox. The first day of spring in the northern hemisphere. If Imbolc was a breath on the wind …Ostara is the refresh. The jolt, the spark, the greenery. Life comes alive. The rebirth of nature. The fertile 5 elements of Earth, Air, Fire, Water and Spirit combine for growth. The Cross, the Wheel of the Year. Night and day are almost equal. I love this time of year as it’s the big wake up. The flowers begin to bloom. Colour returns. This is a personal favourite on this album. This track has orchestral instrument arrangements such as French Horns and Clarinets. Whilst a big fan of using the Harp. I put in the pulse of rhythms for this true awakening and celebration. 5. Beltane (30th April-1st May) The festival of fire. This is the beginning of summer. Known as May Day. Bonfires are lit to honour the sun for future harvests. Originating from the Celtic God ‘Bel’ (The Bright One). The rhythm. With guitar, mandolin and drums. This track encapsulates the power and the passion. Dance round the maypole in the wild. Here is a clip of me recording a guitar part. 6. Litha (Summer Solstice) (21st June) With the longest day and the shortest night. The sun is at its Zenith. The Fire Festival with The Sun God. Stonehenge gatherers celebrate midsummer with rituals. This was the first track I composed and recorded for 8 Sabbats. Happy times, sunshine and excitement. 7. Lammas Lughnasadh (1st August) The prelude, first harvest of the season. The festival of the cutting of the grain. From the Irish God ‘Lugh.’ This music for a medieval feast. Don’t forget to make Corn Dollies! The Autumn Equinox, the harvest and changing of the seasons. I also cycle through the Wheel of the Year with composing tracks for my forthcoming album (2018 release) ‘8 Sabbats’ by Earth Tree Healing. The darkness is coming. I’m at the point of disillusionment in Muggleland. Whilst grateful the bills get paid and a few treats. Its very easy to get sucked into that vortex and remain totally unfulfilled and frustrated. Anxiety and stress levels increase. Change is on the horizon. Which is only a good thing. The stagnant pond that has been… needed it. A feeling of hopelessness has enveloped for a month. Whilst I accept I’ll never really fit into that world. It still stings. My soul and fingers are given to creative adventures. Once I enter the healing room/studio. Thats where the magic happens. Bliss returns. A rotation of Rose Quartz and Amethyst is pillow rotation to help the bad dreams of late. Yes these current energies are creating havoc. When one feels them as I do. It makes my exposure to the bad ones, the liars, the lazys, the users, the manipulators .. one giant ice cream headache. In this world I am at time so very lost and disappointed with peoples selfishness. Even after a week off on hols. We did some serious life reevaluating. I want to become a recluse for 6 months and recharge. But…the drive to succeed is strong. Sometimes you just have to get on and make the best of what today brings. But on a positive. The practicality and decision to better balance my life has been made and fingers crossed begins soon. The wants for a Hurdy Gurdy after a trip to Arundel Castle watching jousting is a treat waiting to happen. Getting back to nature and my Pagan roots has been refreshing and inspiring. When one is all time consumed. The Universe will interject occurrences to freeze frame and rethink the master plan. We spent last Sunday seeing old friends at Pagan Pride in Nottingham. The need to reconnect is now stronger than ever. A canal boat ride at Cromford Canal. On a sunny Saturday afternoon chatting to strangers was needed. I shot this video footage to Mabon. A Psychic Supper last night with Sally Wathen at Rainbow Bridge. The realisation further being confirmed each time I visit to just do it! Things, synchronicity and sods law can have one almost bitter seething on the edge of a razor. When you find out the world is flat and enter the rabbit hole. Its time to step back. Switch it all off and make music. With quite a few albums in the pipeline for 2018 onwards. Claudine is a busy Bog Woppit. I keep affirming that everything is going to be ok. It is isnt it? 1 day later. An amazing opportunity occurred…. I love the Universe. A day after that. Another box ticker. Hard work, dedication, positive mindset. Doing things for the right reason brings an incalculable abundance to my life here. When I close my eyes and channel energies. A comfort blanket of darkness envelops me and I drift. I drift to pure relaxation. Upon waking body and mind are calm. I feel good. Coping with everyday stresses I now tolerate. Coping with the other things.. It gives me comfort and strength. I regularly speak to Angels. I ask for help, advice and sunshine.’ Enjoy. The tracks Guardian Angel, Ariel and Metatron are tuned to 432HZ. Some say this frequency vibrates with the Universe I personally, (during the mixing and mastering process) compared these 3 tracks to the usual 440HZ tuning and found the experiences to be more relaxing at 432HZ. Released digitally 25th February 2017. This follows ‘The Journey’ a collaboration with Sally Wathen at Rainbow Bridge, who always makes me feel better everytime we visit. She helps confirm that making music is my path, ignoring that path is not an option. Which is why once I invested in new studio equipment after my old Fostex machine retired by both effectively ‘dying’ on me after 20 years. I’ve invested in Logic Pro X and am learning its use step by step by watching Youtube videos as lack a good attention span with I worked mostly evening and weekends around my day job. Inspired and indulging in blissful musical quiet times making these albums. We are happy to announce that The Journey is available to buy from digital stores. 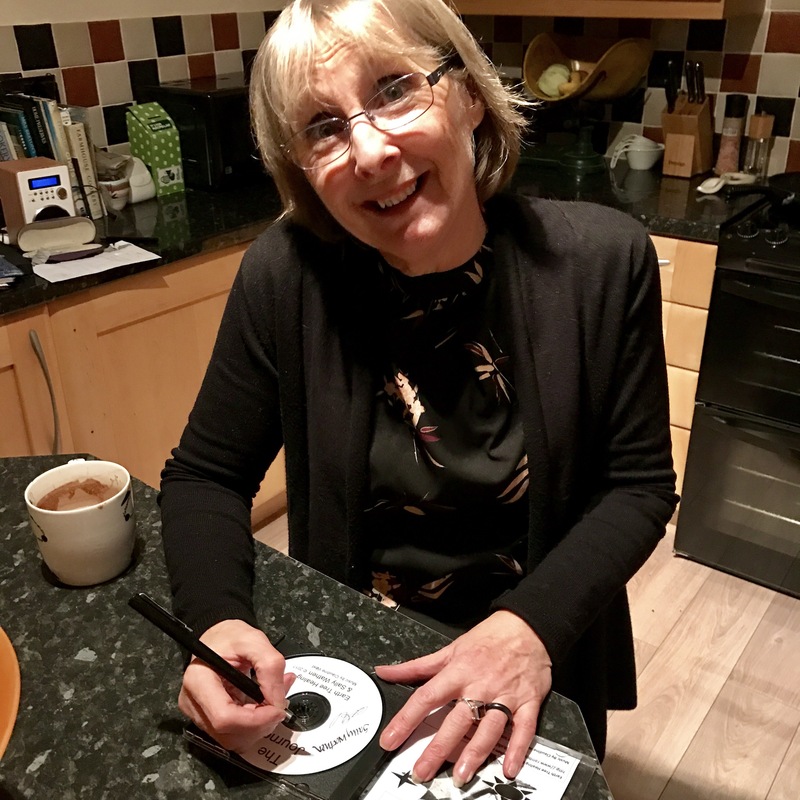 CD’s are also available from Sally Wathen. This album is dedicated to Doug. 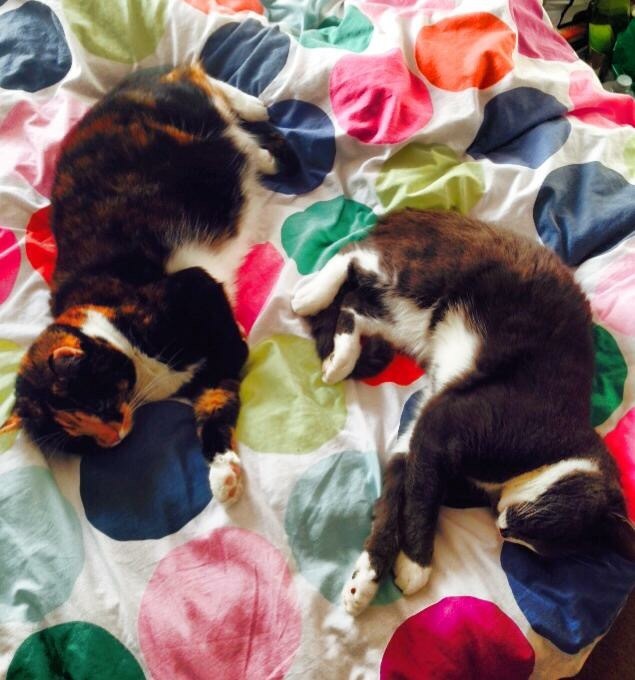 P.S these little scamps (Pattie and Rambo) continue to jump on keyboards and miaow for extra fuss during recording sessions.. The Journey Album CD launch 15.02.17 with Sally Wathen at Rainbow Bridge. Welcome to the flood…When the molten core of a sublime energy is explored. With the energy that flows through a conduit from Heaven and Earth. Bliss…and …well being create a beautiful sky of oranges, blues, purples. That Zen moment when worlds collide. The physical and metaphysical, emotional and spiritual. When one exists in peace, safety, purity and decisive thought. No longer a traveller along the rivers of blood that the world created many seasons ago. In a time before a time. With a trigger of recognition and fortitude. The formative years flash forward into a rainbow of light. Do you now sink back and become the absorbed kin that always was? Feel comfort and gratitude for the visions that present themselves. Or fly on the magic carpet of good vibrations? Where it’s a happening or a happened. Enjoy, deal and deliver yourself. Sometimes you don’t need pictures, you just need sounds. You are the audience to yourself. I channelled Ki Energy last night. I lit my salt lamps up and treated a friend to a Reiki Session. (I had begun channelling before I studied Reiki techniques) I’d not practised in a while- well only during the writing and recording process. It felt great. I wrote the music I made for this kind of adventure. Last night I put them both together and road tested. Track ‘Raphael’s Healing’ definitely did the trick as I worked on her Chakras. It’s a raise in key as well as vibrations. Angels are always invited and assist. In 2016 I released the albums ‘Citadel’ and ‘Archangel Divination.’ It’s been a creative journey. 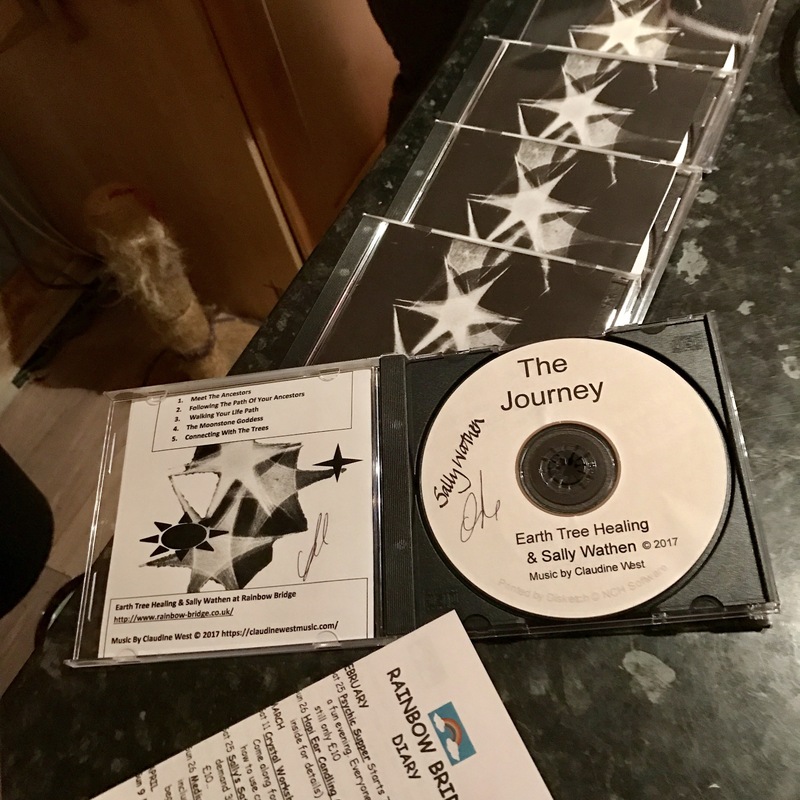 Under ‘Earth Tree Healing.’ 2017 will see the release on digital stores of the Guided Meditation album ‘The Journey’ featuring Sally Wathen at Rainbow Bridge. Close your eyes, open your heart and mind and listen. You can find clips and the tracks via the following links.